What do they say the perfect woman should be? A maid in the living room, a cook in the kitchen and a **** in the bedroom. Sounds like a great deal we have going there… Then again, if you add the Demy to the mix, it might make our job slightly easier. But what is this rather delectable looking device, and how does it work? 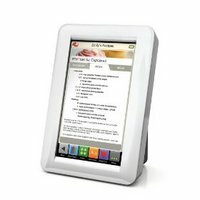 The Demy is a touchscreen digital cookbook, which can store up to 2500 recipes. You can browse through them on the device and add your favourites to your shortlist. 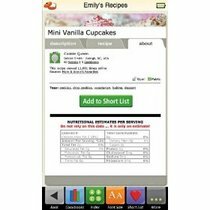 The idea is that you use this in conjunction with the Key Ingredient site, which has masses of free recipes for you to download. The device is uses a fully colour touchscreen, and you can sync it to a Mac or PC with a USB cable. They’re a little vague on product specs, but they say the screen size will be 5×7, and that the capacity is for 2500 recipes, with no mention of what the internal storage is. It does come equipped with a couple of nifty features though, and I’m particularly impressed with the fact that they’ve included three timers, which you can set per recipe, so you know just when to take the meat and veg out. There’s also a conversion tool, which lets you decipher American recipe ingredient portions and a handy ingredient substitution list, to save you running to the shops when you’re out of flour. The font size can be changed, and you can either prop the Demy up on its stand, or have it lying flat on the counter. It’s splash resistant, which is apparently why they’re calling it ‘kitchen safe’. Whether it will stand up to be knocked on the floor in the flurry of cooking is another matter, but let’s not quibble now. It’s a nice idea, and I like the fact that all the recipes are free, but I do have to wonder about the price. It seems like a lot of money for something that might have a short shelf life, and we’re not given any info about whether it runs off batteries or mains power. You may also not be a fan of the Key Ingredient site which would invalidate the pint of purchasing a Demy, and when they say kitchen resistant, I’d like it to be durable enough to stand up to knocks and bumps.